One of the earliest forms of portable illumination, candles have served vital functions for humankind throughout history, a fact chronicled through the discovery of candles or candle-like objects in virtually every society. Historians believe the original candle may have been invented by primitive men who dipped dried branches in animal fat, thus producing a slow-burning and reliable source of light. Reliefs belonging to the ancient Egyptians depict the use of candles by writers and philosophers who worked well after sundown. These early candles were most likely developed from tapers that were made of fibrous materials mixed with wax or tallow (the white, nearly tasteless fat of cattle or sheep that was also used to make soap, margarine, and lubricants). As far back as 3000 B.C. , dish-shaped candles were used on the island of Crete. Candles have also been used for religious purposes. The Bible, for instance, makes numerous references to the use of candles, including the story of King Solomon who, after building the Temple, used ten candle-sticks to light the north and south ends of the structure. In the Middle Ages, candlemaking became a popular occupation, as evidenced by the creation of many candlemakers' guilds throughout Europe. Later, candles were used as a means of keeping time. At auctions, the bidding time was limited by inserting a pin into a candle and letting the wax melt until the pin dropped, thus concluding that period of time. Although the materials that comprise a candle have changed through the years, the art of candlemaking has remained surprisingly similar to the original production processes. Candle wicks were, at first, made of reeds or rushes; eventually, various natural fibers were used. In 1824, Frenchman Jean-Jacques Cambaraceres introduced an important refinement in wick technology with the plaited wick, which burned more evenly than unplaited wicks. Twisted or plaited cotton still makes up most wicks today. Animal or vegetable fats were used for the first candles. As candlemaking technology progressed, beeswax became widely used, mainly because of its pleasing odor and the absence of the mess that melting fats produced. 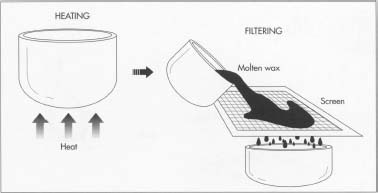 After the wax base is heated into a clear, near-liquid state, it is filtered to remove any impurities that might interfere with the finished candle's burning process. Any dyes or perfumes are added at this time. from dried rushes, which were peeled on all but one side, revealing the pith. The wicks were repeatedly dipped into the molten fat until the fat had stuck to the wick at a desired thickness. Beeswax candles were constructed using both the dipping method and pouring method. In the pouring method, the melted beeswax is poured over a suspended cotton wick while the wick is simultaneously and manually twirled. After a sufficient amount of wax has gathered at the bottom of the wick, the candled is reversed and poured from the other end. Large-scale manufacture of candles became a reality only after 1834, when Joseph Morgan introduced the first mass-production candlemaking machine. Today's modern machines are strikingly similar to that original machine, with speed, accuracy and finished quality the only major differences. As mentioned earlier, the types of wax used in the construction of candles have changed greatly during the past few centuries. Today, substances are often mixed together to create stronger candles with higher melting points. In the United States, standard commercial candles usually contain 60 percent paraffin, 35 percent stearic acid, and 5 percent beeswax. Some candles contain small amounts of candelilla or carnauba waxes (from the carnauba palm) to regulate the softening or melting point of the finished wax. Beeswax candles are made of only pure insect wax and paraffin plus a small amount of stiffening wax. The wick is made of a high grade of cotton or linen. The material is woven (or braided) so that it will burn in one direction and will curl so that its end remains in the candle flame's oxidizing zone for even and intense burning. Often, wire-core wicks are used. These wicks have a wire center that allows them to burn slightly hotter than cotton and remain erect in the melted wax. Decorative candles often use waxes other than beeswax and paraffin. Bayberry wax (or wax myrtle, as it is sometimes referred to) is derived from the fruit of the bayberry bush and has a distinctive aroma making it especially popular for use at Christmas. Non-burning wax is used in those parts of a candle—mostly the shells or ornaments of decorative candles—that are not intended to burn. One method of forming candles is to extrude the wax through a die of the desired shape. 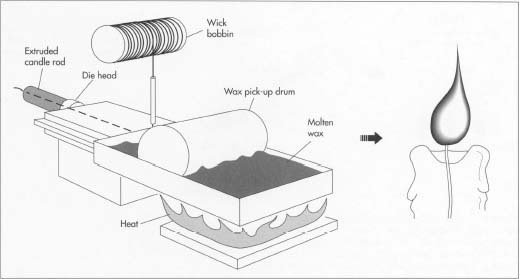 A wick bobbin feeds wick into the center of the mold so that the wax forms around the wick. Unlike molding, extrusion forms one continuous length of candle that must be cut into the proper sizes. slowly, then the amount of exposed wick increases and the candle becomes dangerous. 3 Since the invention of Morgan's first candlemaking machine, the construction of candles has been performed mainly by continuous molding machines, although manual machines are still used by some companies. Continuous molding machines are designed to make candles in groups ranging anywhere from 50 to 500 per load. The entire process takes almost 30 minutes per load. Millington, Deborah. Tradition Candle-making: Simple Methods of Manufacture. Intermediate Technology Development Group of North America, 1992. Rupp, Becky. "The Art of Candle Making," Blair & Ketchum's Country Journal. January, 1986, p. 57.
hai i am shafeeq from shimoga,karnataka. i need information about availablity of raw materials used in manufacturing of candles. and the best marketing.thanking you. Thank you for the valuable information. Would you outline how to treat the candle wicks using the organic chemicals?